This course is designed to immerse students in the intensive and spiritual teachings and practices of traditional Hatha yoga, focusing on breathing, awareness, meditation, and practical philosophy to help you live a less stressful, contented, and harmonious daily life. You will gain a professional yoga teacher's qualification which makes you eligible to register with Yoga Alliance as Registered Yoga Teachers (RYT®). This will give you the skills and experience to start teaching yoga professionally. Come and deepen your yoga practice in India! During your stay, you will be accommodated at Holistic Centre for Yoga and Vedanta. This center is an ashram founded by Pujya Swami Dayananda Saraswati Maharaj, Amboli, Maharashtra state, India. This ashram is more known as yoga ashram in the nearby locality in Amboli. Feel the spiritual atmosphere of an ashram. If you have completed the training successfully, you will get a certification upon completion from Aarsha Yoga Vidya Peetham. Aarsha Yoga Vidya Peetham is recognized by Yoga Alliance in the USA and Canada as RYS (Registered Yoga School) and their team has great yoga acharya, psychologist, and philosophers. This allows you to use the certificate for insurance and taxation purposes and with your certificate. You can register as a RYT 200 for your career and job opportunities. Aarsha Yoga Vidya Peetham embraces diversity and welcomes serious yoga students of all ages and walks of life. They have taught students in their late teens and sixties. They expect you to have a regular yoga practice (and preferably a simple pranayama practice) and a willingness to respect and recognize the power of yoga to transform your outlook on life and its ability to steady the mind and body. Above all, they ask you to trust yourself and open your heart and mind to the opportunities that are presented to you. Smoking is strictly prohibited during this training. Even if you are not interested in teaching yoga, the course will help you to lead a healthier and more spiritual life in accordance with your true nature. You will learn from the real Indian yoga masters. The team consists of experts in the field of yoga, Ayurveda, Sanskrit, Vedanta, philosophy, Siddha medicine, Kalari, and Marma. This course will be led by expert registered yoga teacher faculties. From these masters, you can experience why yoga is a way of life and not only a form of exercise. Feel the difference in learning from real yogis. The students are continuously assessed throughout the course at all levels. There will be a practical observation session towards the end of the course to evaluate the understanding and skills of the students. The origin of Ayurveda, the most ancient form of medical science could be traced back to the Vedic literature. The crucial difference between Ayurveda and modern medical science is that Ayurveda is not just physical treatment, it takes a human being as a whole that is body, mind, and soul. The Sanskrit word “Ayurveda” means the knowledge of life, “Ayur” meaning life and “Veda” meaning science. It is the art of healthy living that enables you to find a perfect harmony between your body and mind. Whereas modern medical science treats only the infected part, Ayurveda treats the body as a whole. Along with curing ailments, Ayurveda gives equal importance to preventative measures too. Ayurvedic massage and panchakarma (detoxing and regenerating the body and treating ailments) can be arranged for students who are interested in staying on after the course. This includes the study of yoga sutras, historical evolution of yoga, living a yogic lifestyle in a materialistic society, and ethics for yoga teachers. Basic Sanskrit and mantra translation classes will be offered. This includes teaching practice, observing others teaching and receiving and giving feedback. This includes principles of demonstration, observation, assisting or correcting, instruction, teaching styles, qualities of a teacher, and help with setting up your own yoga classes. This includes asanas, pranayamas (breathing techniques), kriyas (detoxing or cleansing techniques), mudras (symbolic gestures), bandhas (energy locks), meditation, chanting mantras (optional), and basic Sanskrit. These hours are a mix between analytical training in how to teach and practice the techniques and guided practice of the techniques. This includes both human physical anatomy and physiology (bodily systems, organs, and more) and anatomy of the pranic body, such as chakras, nadis, and so on. It also includes both the study of the subject and application of its principles to yoga practice (benefits, contraindications, healthy movement patterns, and so on). This time table is subject to change as per weather conditions. Classes are held for six days a week and the seventh day is for optional trips to cultural and spiritual places. Bhoomaji started practicing yoga in 1988. He has 19 years of experience of teaching yoga. From the Sivananda tradition, Bhoomaji completed the yoga teachers training course and advanced teachers training course (ATTC) in 1996 and has also completed three Sadhana intensive courses since then. Bhoomaji also studied Sidha Vaidyam (a form of alternative medicine in South India) and Marma Vidya (pressure point) from Rajkumar Aashan, in Marthandom, Tamil Nadu. He is registered with Yoga Alliance as an expert yoga teacher. Born and educated in Tamil Nadu, Swamiji is a disciple of famous Swami Dayananda Saraswati. He studied Sanskrit language and traditional scriptures from 1992 to 1998 in Arsha Vidya Gurukulams, both in Rishikesh and Tamil Nadu. He was initiated into complete monkhood (Sannyasa) by Swami Dayananda Saraswati in 1998. For the past 12 years, he has been teaching Sanskrit, Vedantic Scriptures, and Bhagavad Gita in different places in India and Sri Lanka. Dr. Benoy started his Ayurvedic practice from Sree Narayana Ayurveda Hospital and Pharmacy, Kancheepuram in 1993. In 2000, he completed a Bachelor of Ayurvedic Medicine from S.J.S. Ayurveda Medical College, Chennai. He has established his career as an Ayurveda physician in both private and government institutions for more than 10 years. In 2014, he completed a Doctor of Medicine (M.D.) in Ayurveda psychiatry from Kerala University of Health Sciences, Thrissur. He is an expert in taking classes in Ayurveda, anatomy, physiology, and yoga therapy for foreign students. P.S. Parameswaran has over 10 years teaching experience. He completed his yoga teacher training course, advanced yoga teacher training course, and intensive pranayama course at the Sivananda Yoga Vedanata Ashram, Thiruvananthapuram. He was the yoga teacher in engineering college, Chengannur, N.S.S. Ayurvedic Hospitals, Vallamkulam, and Aranmula in Kerala. He also worked in Ayurveda Yoga Villa, Wynad, and Sarai Resort, Leh, Ladakh. This teacher training will take place in Holistic Centre for Yoga and Vedanta, in the serene atmosphere of Amboli, Maharashtra, India. Being one of the most beautiful and composed places on earth, the Amboli's hill stations and country’s ambiance provide you a wonderful spot to flourish your yogic life. You will be provided with delicious meals including brunch and dinner. Hot lemon ginger drink and fruits are also available. Enjoy Ayurvedic massage and panchakarma (detoxing and regenerating the body and treating ailments) that can be arranged for you who are interested in staying on after the course. Since the classes are held for six days, you can also experience optional trips to cultural and spiritual places on the seventh day during your stay. Please book your flight to arrive at Goa International Airport (GOI) in Goa. Chennai International Airport (MAA) in Chennai, Chhatrapati Shivaji International Airport (BOM) in Mumbai, Indira Gandhi International Airport (DEL) in Delhi, and Bengaluru International Airport (BLR) in Bangalore are the nearby airports you can take where you can fly to Goa. From Goa, you can take a bus or taxi to the ashram location. If there are other students arriving or departing at the same time, you have an option to share the taxi and the price with them. Please inform Aarsha Yoga Vidya Peetham at least 10 days beforehand if you need an airport pick up and tell them your flight details (including airline, time of arrival and departure, and flight numbers). The closest railway stations to the Amboli ashram are the Sawantwadi Road railway station and Kudal railway station which are on Konkan railway route. These are not major stations. All trains may not have stopped here. Amboli is 30 kilometers from the Sawantwadi Road railway station. The major railway station, Madgaon Junction railway station (110 kilometers from Amboli) is also along this railway route. The other major station close by is in Belgaum and this station is not part of Konkan railway route. All these stations are linked to all major cities in India by rail. From these railway stations, take a taxi or bus to the ashram. Amboli is 110 kilometers from Goa and Goa is 70 kilometers from Belgaum. Ashram guests who want to arrive by train are advised to book rail tickets as early as possible. Trains are often fully booked. Train e-tickets can be booked up to three months in advance via the internet. 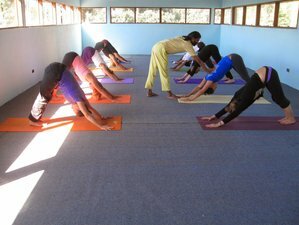 Aarsha Yoga Vidya Peetham runs 200 and 300-hour yoga teacher training courses based on Hatha yoga practices, which are accredited by Yoga Alliance USA.